Royal Oak, Ferndale, Southfield, Washington Twp, MI- When you ask some kids what they want to do when they get older, some will pipe right away up with an answer. For example, Janese James wants to be a psychologist. Mikayla Jackson wants to be a chef. And Kennedy Allen wants to be a lawyer. There are also young people who are still examining many interests without really knowing where they will end up. 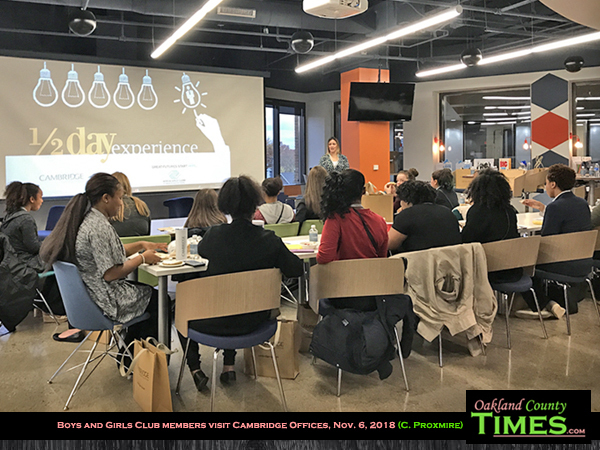 In Boys and Girls Clubs of Oakland and Macomb Counties, there are kids of both persuasions finding support as they grow from children to adults. 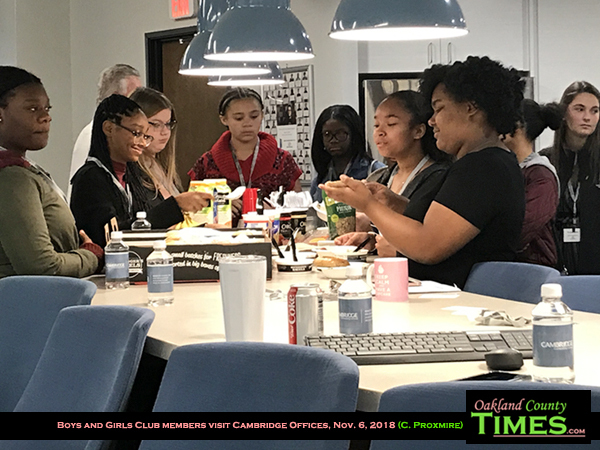 Fifteen of these young ladies from the Club’s four locations (Royal Oak, Ferndale, Southfield and Washington Township) got an experience in growth last week at a half day visit to Cambridge Consulting in Downtown Royal Oak. 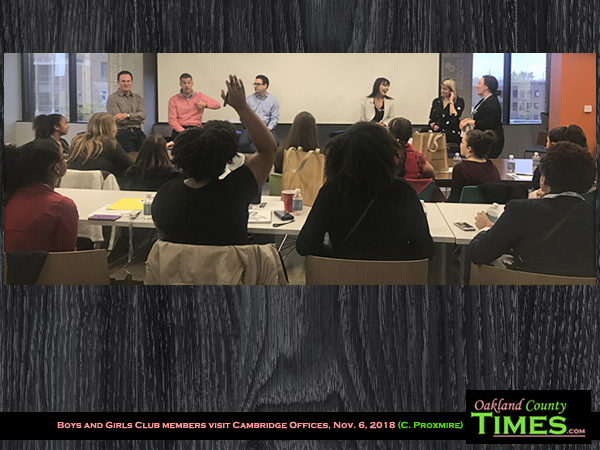 They met with a team of professionals working in sales, finance, insurance, risk management, wealth strategies, and human resources. 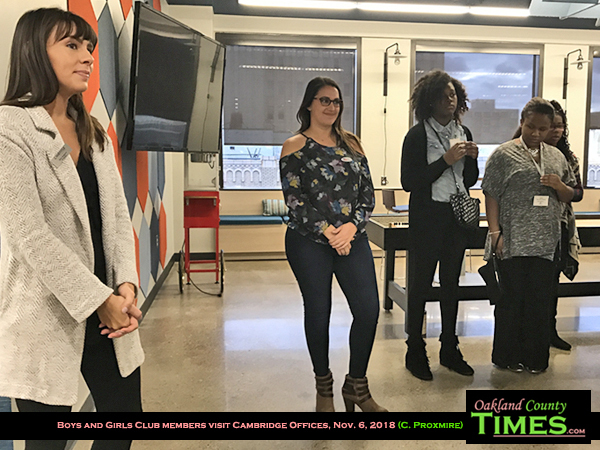 They got to tour the office and experience a professional work environment. 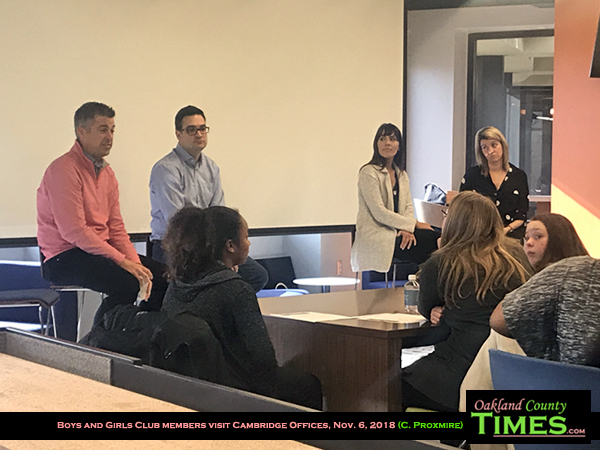 They got to hear how various team members got to where they are today, and what advice they had to share. Director of Finance Lynn Jones learned at the age of 11 that she was passionate about numbers and finance. “If you have something you’re interested in, look into it. Talk to people who do this, and learn what you can. You may find it’s not for you, but if you keep looking you will find it,” she said. 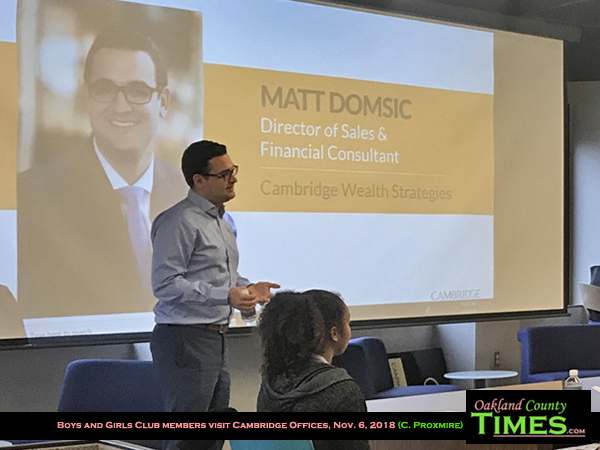 Financial Consultant Matt Domsic encouraged the girls to consider careers in finance. “Financial services is dominated by men, but women are really better at their job. They can connect with people on an emotional level. There should be more women in this industry,” he said. He explained that the more you put yourself out there and take chances, the more you grow and achieve. Domsic did ask for more money, and he got it. 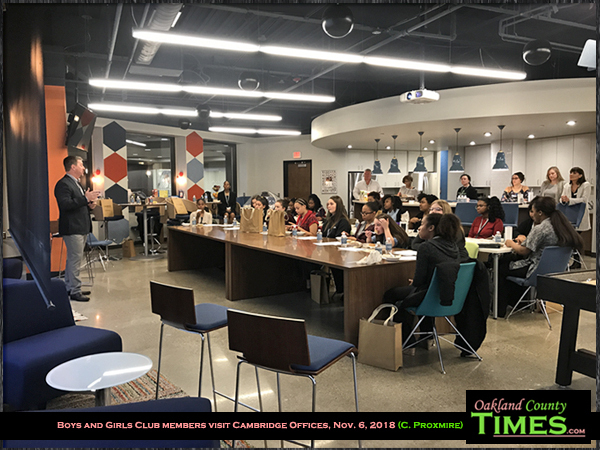 The goal-setting part of the program helped them take what they’d heard from the speakers and apply it to their own dreams. The youths divided into teams of 4-5 to each work with a Cambridge employee. Jones also likes helping younger kids at the club to feel welcome and engaged. Among them is 13 year old Mikayla Jackson who is determined to be a chef. 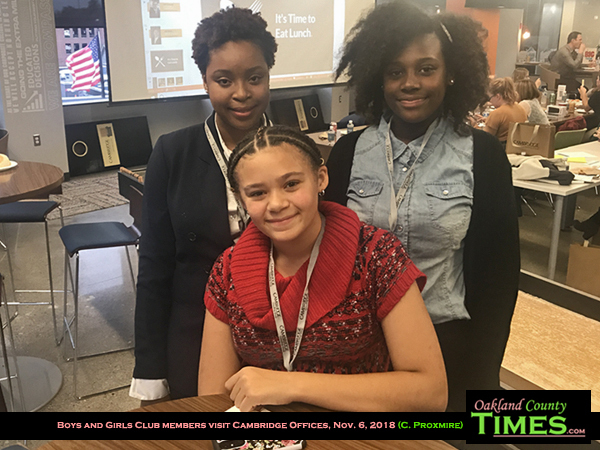 For 13 year old Kennedy Allen of Ferndale, the Cambridge experience helped her think about her potential path towards being an attorney. Or maybe not. One thing that kids realized from the presentation is that people change paths all the time. One of the professionals had become a salesperson while their dreams of being a professional golfer became a hobby that he still loves. Another started out as a teacher before finding the world of finance to be a better fit. “Life is not a straight line. It’s changing schools, its changing jobs, moving around, changing careers,” said another. No matter how the career path looks, there are skills that are good for anybody. “At Cambridge we have core values as a business. But we also have core values as individuals. For yourselves, you should have core values,” said CEO Dan Cornwell. 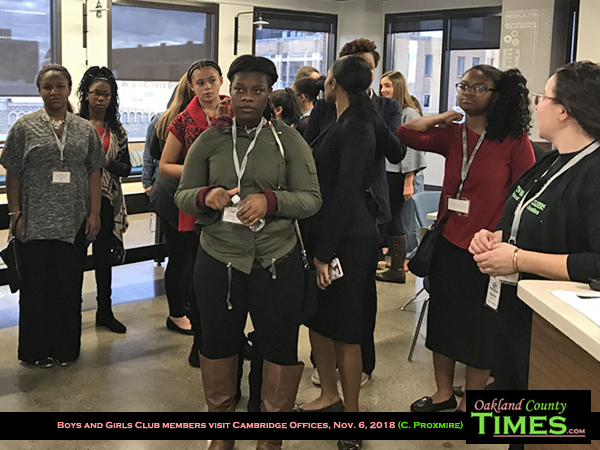 The half-day experience also taught the girls about networking, and the value of knowing lots of people. And, it taught the importance of having good people in social circles and on work teams. “I prefer to surround myself with people who are smarter than I am,” Cornwell said.